Now you can build the world of the cutest, most-collectible characters with Shopkins Kinstuctions Scene Packs! Each pack comes with a buildable set and 5 buildable figures that you can mix and match! 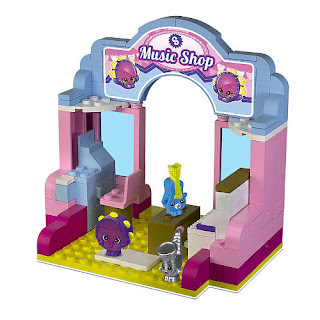 Build, Shop and Kin'struct your Shopkins world! Includes: 5 Buildable Figures, Set and Accessories. Figures included are Toasty Slipper, Roasty Slipper, Jessie Dressing Gown, Good Night Gown and Olive Overnight Bag. Now you can build the world of the cutest, most-collectible characters with Shopkins Kinstuctions Shopping Packs! Each pack comes with a buildable set and 3 buildable figures that you can mix and match! 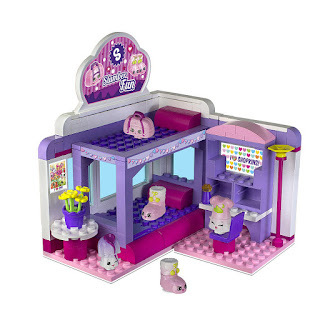 Build, Shop and Kin'struct your Shopkins world! Includes: 3 Buildable Figures, Set and Accessories. Figures included are Plucky Guitar, Tammy Tambourine, Max Saxophone. Now you can build the world of the cutest, most-collectible characters with Shopkins Kinstuctions Mini Packs! Each pack comes with a buildable set and 2 buildable figures that you can mix and match! Build, Shop and Kin'struct your Shopkins world! Includes: 2 Buildable Figures, Set and Accessories. 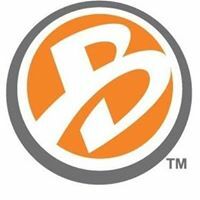 Figures included are Satchel and Bop Top. Build a world of the cuteness with The Bridge Direct's Shopkins Kinstructions Sets! Shopkins are totally adorable and seem to be everywhere these days. My kids love to watch the show and collect the cute little Shopkins figures. 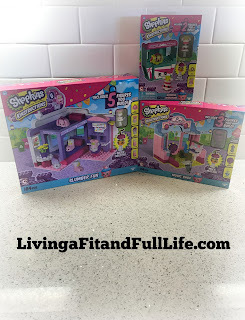 Shopkins Kinstructions Sets are fairly new to us but are very similar to some other building sets we have, but since these combine our favorite little Shopkins characters they've become my girls new favorite toys. Each Shopkins Kinstructions Set is extremely easy to build and I love that my kids can also customize them a bit should they choose to. The sets also come with buildable figures that you can mix and match to make the sets even more fun. The Bridge Direct's Shopkins Kinstructions Sets are the perfect way to beat the heat this summer with some fun indoor play!